Banyan Grove is a physical space for ServiceSpace volunteers to cultivate inner transformation and build deeper ties that foster compassionate acts in the world. Easter weekend, day of silence. How it ended was unexpected. Zendo Inauguration -- How Else? Awakin Circle! Brimmed to capacity, we sat on the freshly constructed Zendo floor, complete with black zafutons and hand-made cushions filled with buck wheat. Ada and Nathan offered some heart-opening music on the harmonium and didgeridoo. During her share in the circle, Claudia said it best with her grateful tears: "There's just so much love in the room." Dereme, our neighbor from across the street left with folded hands and "Thank you, thank you, thank you" on her lips -- which is really how we all felt! Taking our +T circles to another level of dialogues, this time with 40 doctors and healers. A Spaniard and a Canadian walk into a space. We had our first month-long residents! Joserra from Spain, writes: "John, a dear local elder told me before the silence: "This is a very special place, we are witnessing history." I feel the same, we are witnessing the beauty of a different narrative, a different human story which is rooted in kindness, generosity and trust. A quiet challenge, a gentle revolution." In My First Week at BG, Fabrizio writes: "All this to say, what I am experiencing at Banyan Grove as I settle in is not just what I acquire through my five senses. It's not just the beautifully-built house, or the unfinished zendo, or the interactions with many or one, or the beautiful mist in the trees and scent in the breeze, or the mostly unfurnished spaces, or the gardens that need tending, or the stove that needs cleaning, or the Earth flag flying, or the leaves gently falling, or the hummingbirds hovering, or the WiFi that needs figuring. It's all of that, and so much more. I see it all. I see it at once. I see it as One, even. Sit. Share. Serve. Aka, our first Awakin Circle. Blessing Ceremony. Earth Flag was waving happily. Let the games begin -- with a black and white photo. Join an upcoming event. To stay informed, sign up for our mailing list below. Volunteer with us! We're all volunteers, and would welcome your involvement. Host a circle. If you have ideas, drop us an email. Host a retreat. To propose a multi-day retreat, please complete the retreat form. Become a resident. 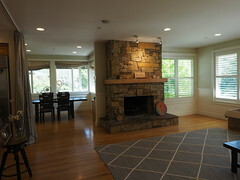 Periodically, we invite ServiceSpace volunteers for short-term stays and longer residencies. Tells us your ideas! We'd love to hear from you! What has been the history of Banyan Grove? 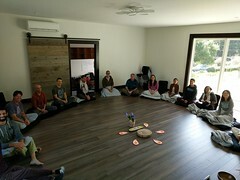 Thus far, we've hosted various evening circles, +Tranformation dialogues, day-long gatherings, silent meditation retreats and multi-day organizational retreats. 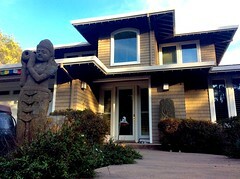 We've also housed various short-term and long-term residents. In alignment with ServiceSpace values, everything is offered as a gift, with an invitation to pay-it-forward with multiple forms of capital. Can you tell me more about the physical space? 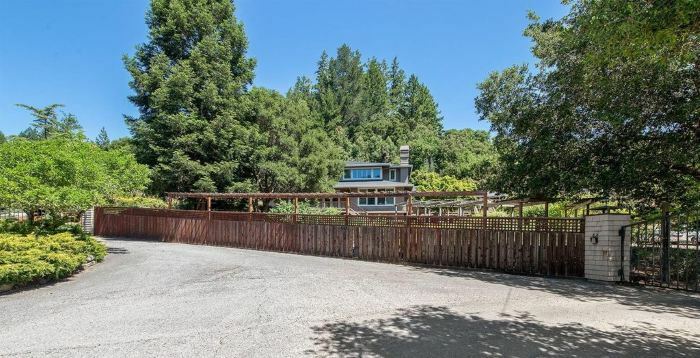 It's a 1.3 acre property with a 3000 square feet home (with a separate cottage), room for tenting, a small meditation hall, ample areas for gardening (including a greenhouse), a fish pond and space for family-friendly events. Lined with redwood trees, the quiet, natureful campus is located in the town of Forest Knolls, near natural parks like Point Reyes National Seashore, Samuel P. Taylor State Park, and monastic centers like Spirit Rock and Olema Vedanta Center. It's about a 1.5 hour drive from SFO, 1 hour from Berkeley, and about 2 hours from the South Bay, as well as accessible via bus. 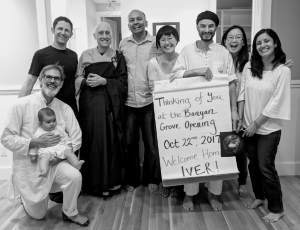 Some photos here, from our opening blessing ceremony. 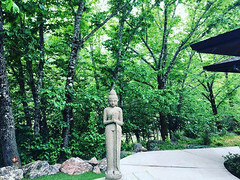 The campus is aligned with 5 basic precepts to preserve an ambiance that is conducive to meditation. Being a labor-of-love space, it is strictly non-commercial and will maintain a vegan lifestyle that honors all life. What's the capacity at Banyan Grove? At the moment, we can host 60+ people for partial day events, 35-40 people for full day events, and up to 15 people for overnight events. We anticipate that capacity will increase, as further improvements are made, and we are working toward reserved certain parts of the space for personal silent retreats. Alongside many volunteers and residents, a six person steering committee manages the operational details of the property. We also have resident anchors who stay on for six months -- Sam and Hiromi were the first, and guitar maker Fabrizio was the second! What kind of events have you hosted? 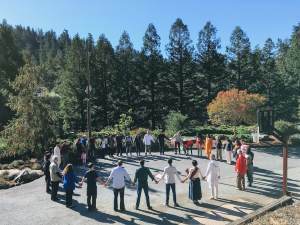 Awakin Circles: On the first Sunday of every month, we host Awakin Circles that are open to the community. 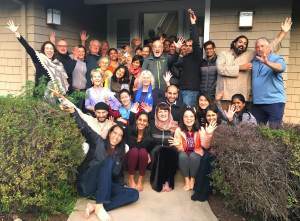 Deep Dialogues: we hold day-long retreats like "Healing + Transformation" that brought together 40 doctors and medical professional for a dialogue on compassion in medicine. (View Photo). Day of Silence: we held a day of meditative silence that culminated with Easter Bows. Film Screenings: with the filmmakers and subject of the films, the idea of host a film and dialogue about collective action. States of Grace. 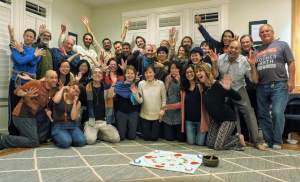 Group Retreats: various like-hearted organizations like The Pollination Project and Heal Initiative have hosted their staff retreats.